I spent most of the period between Christmas and New Year eating fudge for breakfast and saying, ‘what day is?’ repeatedly to Ian; this continued until we went back to work earlier this week. By the time we met up for lunch with our friends, Lauren and James, not one of us seemed to have any idea of what day it was, let alone what to eat. Eventually we decided on Bar Estilo, which seemed to have enough on the menu I’d found online to please all of us. 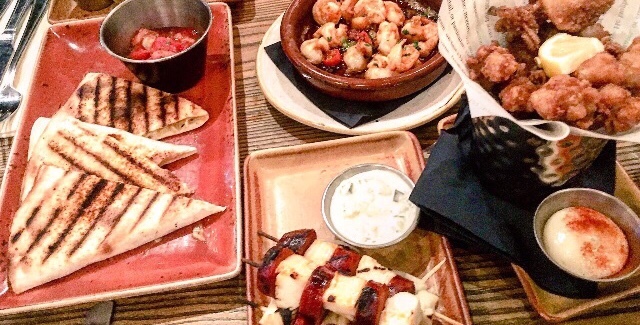 Nestled within the Mailbox complex, Bar Estilo offers casual dining in a relaxed setting. It feels warm and inviting (albeit not particularly unique) with plenty of seating options for outings with friends or dates. 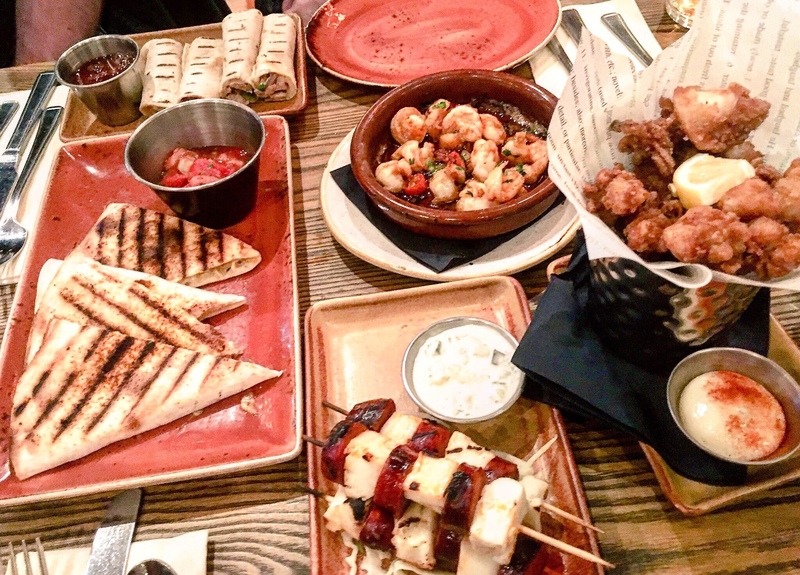 The menu is mainly based around small plates with a large selection of tapas, as well as burgers, grills and Spanish specialities including paellas. 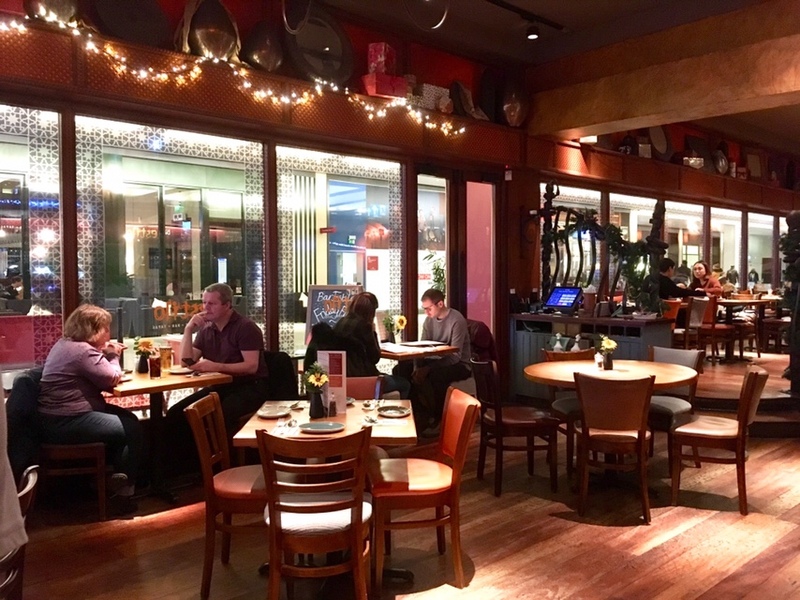 There’s not much for vegans but plenty of options for vegetarians – largely thanks to a dedicated section on the tapas menu – as well as fish and meat dishes. The Husband and I chose to share 5 plates, which in hindsight should’ve been 6 because I’m a beast. The Garlic and Chilli Prawns (£6.95) were well cooked and splashed in a spicy oil that had just enough kick to be tasty without unpleasant heat. As always, I would’ve liked more garlic flavour but I’m aware I seem to say this after most meals. 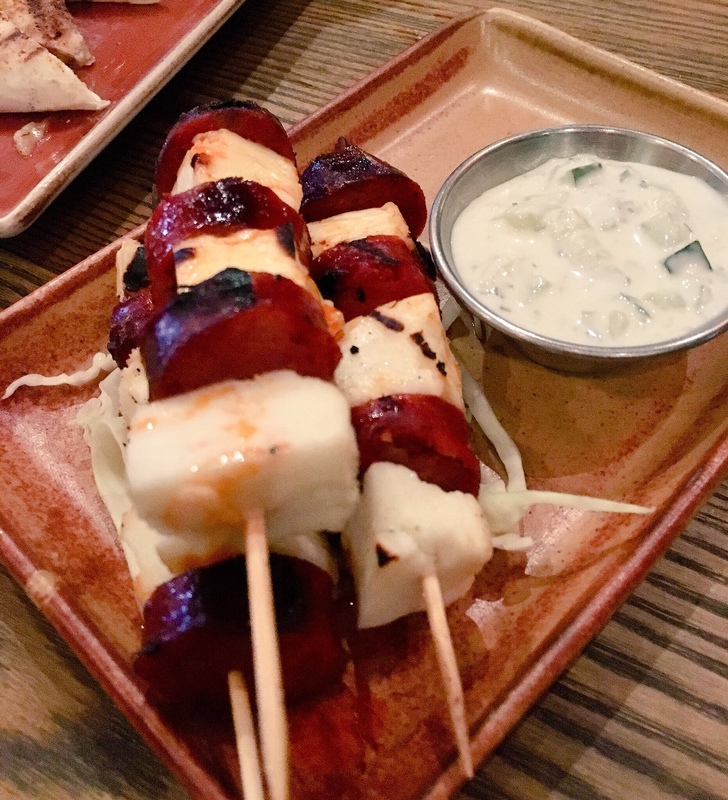 The Chorizo and Halloumi Kebabs (£5.95) come served with a yoghurt and cucumber dip and were enjoyable, with decent sized charred chunks of the paprika-infused sausage and cheese. It’s not rocket science, this plate, but it was eaten quickly and without any issues aside from the fact that 3 is an odd number and I’m actually quite selfish re sharing food. 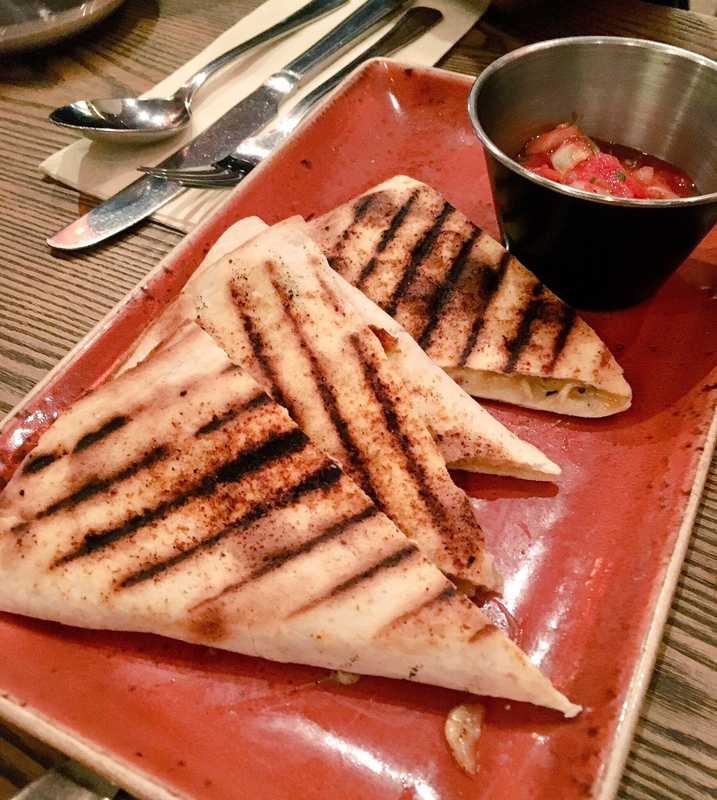 Chicken Quesadilla (£5.95) was our most filling plate of food, providing 4 decent sized triangles of grilled tortilla stuffed with melting cheese and morsels of chicken. The accompanying spicy tomato salsa was fresh and clearly homemade, and packed a crunch and spicy kick – I liked this a lot. 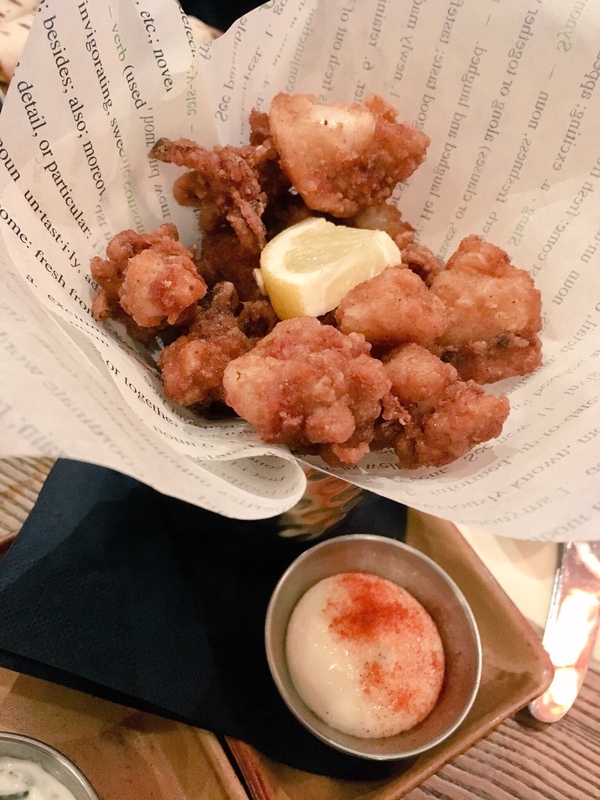 The fried Calamari (£6.95) was my favourite of the plates, with the crispy little pieces of tender squid served like seafood popcorn. The accompanying garlic mayonnaise dip wasn’t exceptional but was pleasant enough, and the bite size chunks got snaffled quickly. I wish I’d ordered more of this, thinking about it. 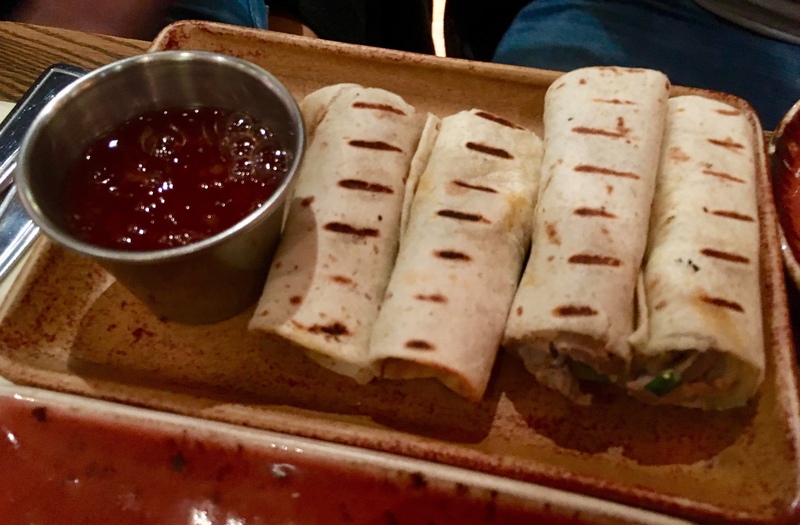 Lastly the Duck Wraps (£4.95) arrived and proved divisive; my other half liked them, while I found them bland and bit boring. The dipping sauce was too sweet and light on the chilli, but at least added some vague excitement to an otherwise “meh” dish. I wouldn’t order this again, but then I wouldn’t have actually chosen it in the first place. I blame my husband for this entirely; I told him (moaned) this at the time when I felt like I’d been robbed of my beloved hummus. Ok, so this isn’t the most authentic Spanish experience in the world (there are other places that do it better, no doubt) and some of the tapas options are a bit misplaced; the Asian duck rolls my other half chose are a prime example. 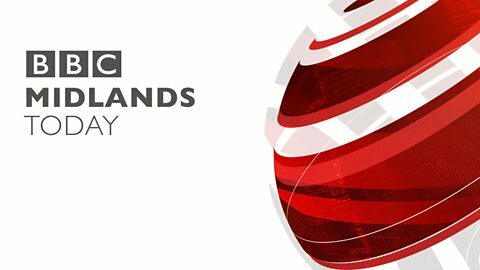 Having said that, we generally enjoyed what we had, it was a decent effort, and the staff were helpful and patient during a semi busy lunch service. The menu on the whole is varied enough that if you’d prefer a burger and beer to tapas and getting wasted on red wine (unsurprisingly I’d happily do both) there’s something to please most people. My friend had Chicken Supreme (£11.95) from the main menu and enjoyed it, although looking around it’s the small plates most diners choose. It’s also good for group dining, and there’s various offers on during the week if you’re on a budget. Our bill for lunch with a beer each came in at just shy of £20pp and I’d say it was a fair price for what we had collectively. I end with a small but valid gripe: booking a table. There’s no online booking service which is a bit annoying, and when I initially rang to book a table as per the website’s instructions I was (quite bluntly) told to call back in ten minutes. I can’t imagine a place of this size has one man and one phone working at mid-week lunchtime, but it certainly felt that way. Thankfully the experience once at the restaurant was much better and I’d likely return. Will you be visiting Bar Estilo? Do you like the food? Let me know in the comments.